Source: Ancestral sketches and memoirs of Mary Julia Johnson Wilson, microfiflm of typescript, BYU. My Grandfather, Joel Hills Johnson, was the eldest son of Ezekial and Julia Hills Johnson and was born in Grafton, Worcester County, Massachusetts, March 23rd, 1802. When he was a small child his parents moved to the state of Vermont where they resided for about nine years. In the year 1813 they permitted Grandfather to go with his Uncle Joel Hills, (for whom he was named) to the town of Newport, Kentucky, on the Ohio River opposite the town of Cincinnati. Here he remained for two years till his father came and took him to Pompret, Chautauqua County, New York, where the family had moved during his absence. Here he lived with them until he was twenty-one years of age, or until March 23rd, 1823. He had little or no opportunity for education, but from a small child was given strict religious training by his mother, and was taught never to transgress the will of his parents or do the least thing which he thought to be wrong, and always to attend religious services. What studying he did was done by firelight after working hard all day. After leaving home he bought a small tract of land on which he built a house and his sisters came and kept house for him. He also bought a sawmill which he operated to earn a living. His sisters remained with him until November 2nd, 1826, when he married Annie Pixley Johnson, and brought her to his home. Annie Pixley Johnson was the daughter of Dennis Welch and Timothy Johnson, Esquire, although thus far we are unable to connect these Johnsons with our family, until the marriage of these grandparents. Great grandfather Johnson, father of Annie Pixley Johnson, was born in Harver Hill, Essex County, Massachusetts, May 22nd, 1768, and died in 1845. Grandmother was born at Canaan, Grafton, New Hampshire, August 8th, 1800. Thus far we have been able to find nothing definite concerning her childhood or her life prior to her marriage to Grandfather Joel Hills Johnson as stated November 2nd, 1826. Nor do we know of their acquaintance or courtship. To them were born the following five children: Sariah, Sixtus, Nephi, Susan and Seth. She died September 10th, 1840, when her youngest son, Seth, who became my father, was a little less than two years of age. In the year 1829, Grandfather Joel Hills Johnson invented and patented the shingle cutter machine now used for making or cutting shingles for many, many years throughout the United States and Canada. The patent is dated the 8th of December 1829, and is signed by Andrew Jackson, President, and by Martin Van Buren Vice-President of the United States. In the fall of 1830 Grandfather moved his family to the town of Amherst, Lorain County, State of Ohio. He first became acquainted with the Elders of the Church of Jesus Christ of Latter Day Saints and with the Book of Mormon, and at once became a convert of this new faith, being baptized into the Church June lst, 1831, and was ordained and made an Elder on the 20th of September following, and was appointed to preside over the Amherst Branch of the Church, then numbering about one hundred members. 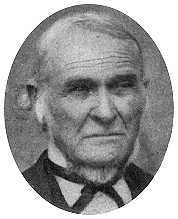 Grandfather Johnson attended the first October Conference ever held by the Mormon Church. It was held in Orange Township, Ohio, in 1831. It was on this occasion he first beheld the face of the Prophet Joseph Smith and heard the "words of life" direct from his mouth, which he writes, "filled his heart with joy and thanks to God." In January 1832 he went on a mission to the state of New York, visiting the home of his father's family in Pompret, and preaching the gospel to them. This they willingly heard and his mother and others of the family were baptized. He continued his mission labors when he returned to Amherst baptizing many in and about that place and ordaining several Elders and Priests. In July 1833, following the counsel of the Prophet Joseph Smith, he moved his family to Kirtland, Ohio, buying out annoying individuals. Thus he was in Kirtland to see the laying of the foundation of the Kirtland Temple, and erected a saw mill to provide some of the lumber for this building. Beginning August 26th, 1835, he filled a short mission throughout the south-east part of the state of Ohio, preaching in many cities and towns, and baptizing several new members before returning home. Then he continued to proselyte and perform missionary labors in the vicinity of Kirtland, baptizing many and ordaining Elders, and receiving a blessing under the hands of the First Presidency of the Church for his labors in preaching and in assisting to build the Lord's house. He was present at the calling and ordination of all the different quorums of the Church, and attended the dedication of the "Lord's House" (Kirtland Temple) March 27th, 1837, and all of the meetings and councils that followed, saw and heard the power of God made manifest as written in the Life of Joseph Smith, and was chosen a member of the Quorum of Seventies appointed at that time, filling several missions under this calling. About this time, Sidney Rigdon, Bishop Partridge and others, who were on their way to Commerce, Illinois, called on him. The location was made and called Nauvoo. In February of 1840, he purchased a sawmill and a piece of land in Crooked Creek, onto which he moved his family. In July of that year the Branch of the Church was organized into a Stake of Zion, with all of it's officers and quorums, grandfather being ordained a High Priest under the hands of Hyrum Smith, brother of the Prophet. A town was laid out and built up by the Saints. Grandfather was made president of this Stake. Shortly after the death of Grandmother, which occurred, as stated, September 11, 1840, leaving him with the care of five small children, Grandfather remarried, this time to a Miss Susan Bryant. Later he was released from the Stake Presidency. He was just eight miles from Carthage when Joseph and Hyrum Smith were Martyred, June 27, 1844, and witnessed the sorrow and commotions that followed this event. On the 13th of the following November he was appointed to preside over the Pleasant Vale Branch of the Church. Under the order of plural marriage, grandfather took to wife a Miss Janet Fife, a Scotch convert, October 25, 1845. May 1, 1846 they were visited by a mob who served notice they must leave this part of the country by the first of June, else their lives would be taken and property destroyed. Grandfather disposed of his more than five thousand dollars worth of property in Hancock County for one team of horses worth about seventy-five dollars, and one yoke of oxen, and with a borrowed wagon, started on the last day of May for Knox County, Illinois, arriving there on the fourth of June to occupy an eighty acre soldier land claim. While in Knox County he was enabled to secure the means necessary for preparing for the journey to Salt Lake City by May 6, 1848. They were provided with plenty of teams and three wagons loaded with family necessities of food, clothing, provisions, tools, etc., also with a few cows and sheep, and arrived at Winter Quarters the first week in June. Here they remained for a month, joining the Willard Richard's Company and moving forward July 5th, 1848, and arriving in Salt Lake City on October 19th. The home conditions tended to draw more closely together the five children of grandmother's, the older ones getting homes of their own and caring for the younger ones. All of them married quite young, except my father, Seth, who left home and started to teach school when he was eighteen years of age, and continued in this profession for close to forty years. "The first I remember of Grandmother's children," remarked Mrs. Wilson, "was my impressions of how these five seemed to cling together, the younger ones depending on counsel and advice, more on their elder brothers and sisters than on Grandfather or his young wives. I remember this particularly with regard to my father, who was about thirteen years younger than his elder sister, Sariah. After his older brothers and sister moved to Dixie and settled in Virgin City, father soon married and followed them. Susan, the younger sister, married and settled in Logan, Utah." Uncle Sixtus filled a mission to the Sandwich Islands when he was a very young man and father made several trips across the plains to help the emigrating Saints on their way to Utah. Whether or not grandmother ever labored in behalf of the church or not, I am unable to say, but their is plenty of evidence that her five children did, and were a credit to her name as well as to their Church. All of her children lived until after father, the youngest one was eighty years old. They also accepted and lived the law of plural marriage, and reared large and respectable families, the two girls having thirteen children each. "Reflecting on what Grandmother's life must have been," says Mrs. Wilson; "I have written these lines in her memory." For she was a church-worker's wife. When no mercy to any was given. No matter what they had to pass through. Until they were very old, they were all alive. Whether for people who were dark or white. As well as doing other Church work too. Grandfather and his three other families, including a young wife Margaret Threlkeld of England, (whom he married in October, 1860, on their arrival at Salt Lake City, from where he had been on a mission in Nebraska,) moved about extensively in various parts of southern Utah, grandfather finally passing away September 24, 1888, at the family ranch in Johnson, Kane County, Utah still declaring his testimony to the world, and praising the Lord in song and with all his heart.